I’m praying for society’s collapse so I can leave the grid already. My Surly Karate Monkey had been woefully underused. 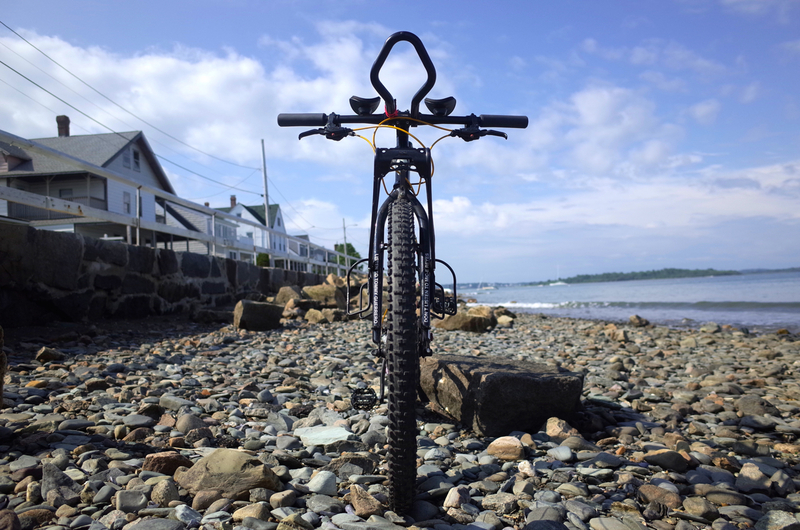 Usually when I travel within the Northeast, I bring a bike with me, and in June, I vowed only to bring the Karate Monkey, forcing myself to get familiar with the geometry and capabilities of the bike. When it came time to plan Kelley’s bike tour, I knew it was time for a real shake-out. 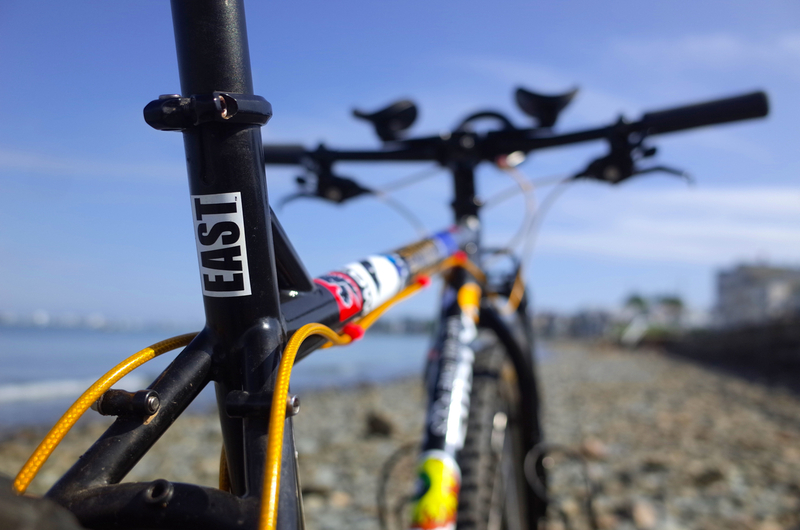 I designed the bike for long-distance endurance races like the CDMBR, but it’s a very versatile frame. 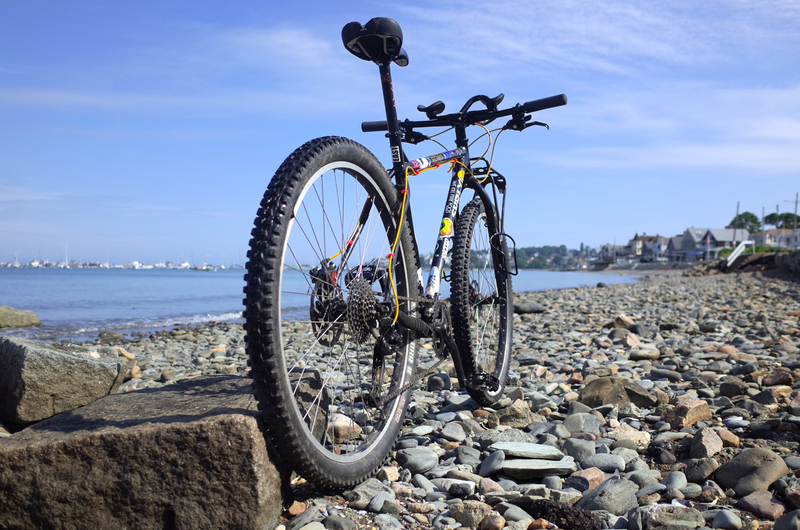 People build up Karate Monkeys for trail riding, urban assault, cyclocross, and just about everything else. Since it was Kelley’s first ride, I set my KM up to handle more gear for the two of us, and this will likely be my setup for winter touring or expedition-style international touring in the future. The bare frame feels light and capable, even with the front rack and aero-bars weighing down the front end. Once I get the wheels replaced this winter, it’ll weigh a pound or two less. As shown, I think it’s around 27 lbs. Here’s the complete components list, with links! Sram’s rear derailleurs and shifters use a 1:1 actuation ratio, which reduces the stress on the cable and simplifies a lot of the setup of indexed shifting. A couple quarter-turns on my shifter’s barrel adjuster is usually all it takes to correct the derailleur after I replace a cable, and it stays indexed for the life of the housing or the death of the derailleur, whichever comes first. I’m using the X9 carbon derailleur, but I may swap it for an X7 derailleur for the alloy pulley cage, which can be bent back in case of a rock-hit. My crankset is geared for hills with a 26-tooth inner ring. The spindle and chainring bolts have seen better days; surface rust is collecting since I keep riding it through deep snow, slush, and flooded trails. I may be up for a replacement sooner than I’d like, but a ship isn’t built to sit in the harbor. 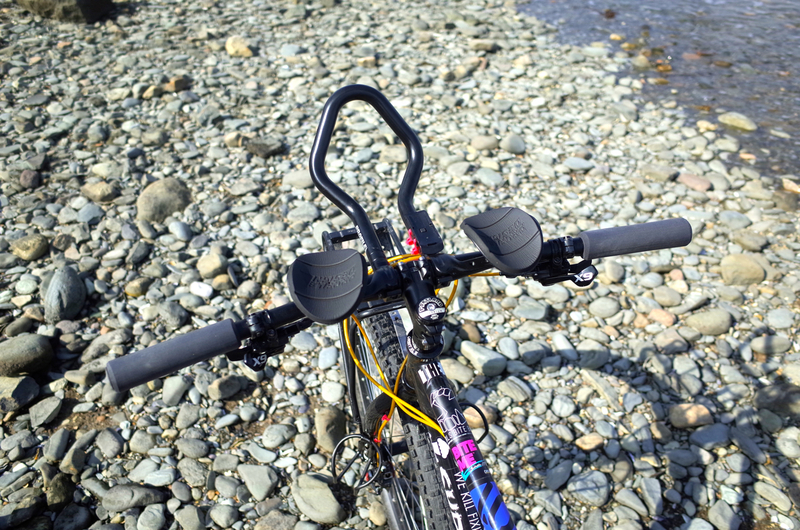 The Racktime front rack, built by Ortlieb, meshes perfectly with the Lezyne Power Cage on my Ogre fork’s bosses. This lets me carry two water bottles directly behind my front panniers for extra stability and capacity. Getting to the portside bottle isn’t the easiest task, but I guess it’s practice for tricky technical riding. 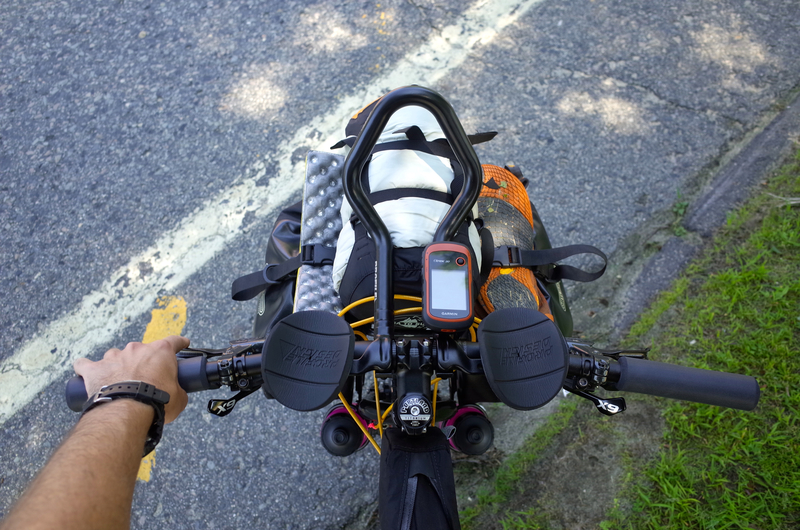 I went with aero-bars for endurance rides, and they were welcome on New Hampshire’s steep descents last weekend. I’m not using them to mount anything other than my GPS, so their utility is underused with the front rack. I’m also struggling with a better light setup — more to come on that front. 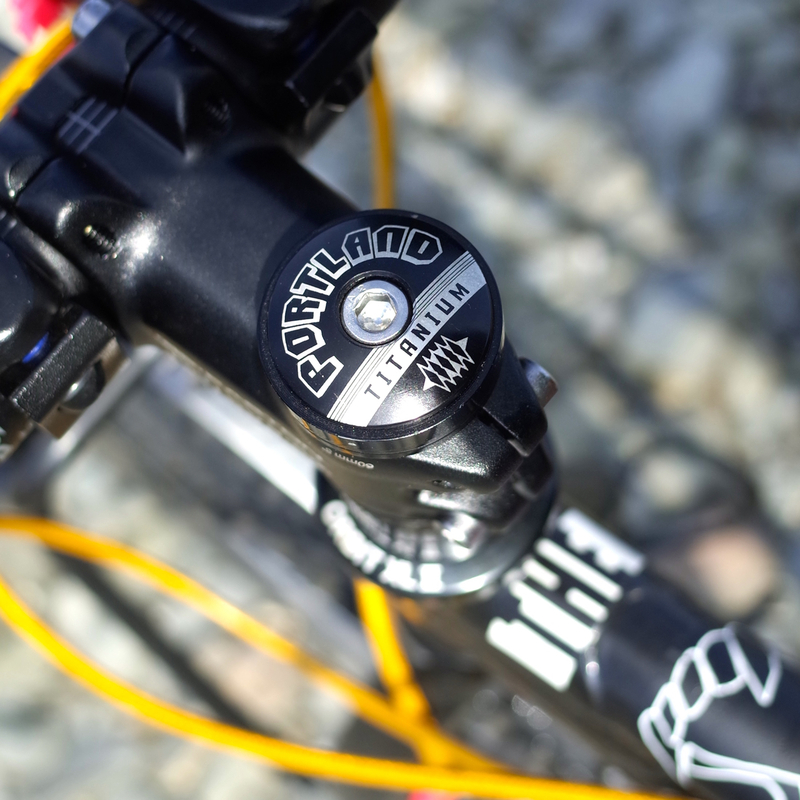 The levers pull Avid BB7 disc brakes, using good old-fashioned steel cables. With Jagwire’s compressionless housing, they aren’t any more squishy than a good pair of hydraulics. I might not have the modulation and precision of some of the nicer Shimano hydraulic setups, but I won’t lose a brake if I catch my cable on a passing tree branch and rip something out. A spare cable weighs nothing and can be replaced in minutes. A short Easton EA-70 stem keeps me upright, and the Orbit XL-II cartridge-bearing headset can take a beating. 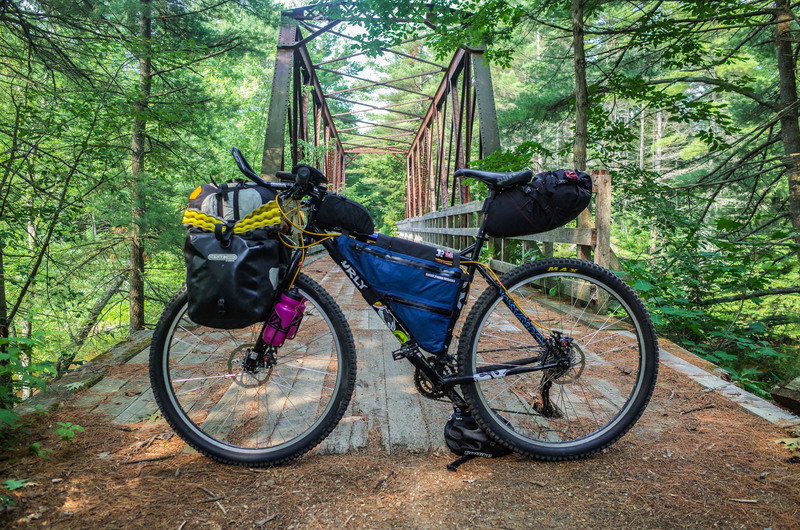 Fully loaded, this bike keeps some of its snappy maneuvering tendencies, but it’s more stable than any other touring bike loadout I’ve ridden. I had no trouble hopping curbs, roots, and rocks, and I rolled straight on three-mile descents at 40+ mph with no wobble or feedback. Here’s my full gear list, minus Kelley’s stuff, which made up about half of the gear shown on the bike. Two Ortlieb Front Rollers mount ahead of the fork mounted water bottle cages, high enough to clear unkept trails, but not high enough to throw off stability. The drybag strapped above them with two Salsa Anything straps holds a bivy and sleeping bag, which collectively weigh a little under 3.5 pounds. I strapped on a Thermarest z-seat, and was glad to have it for Kelley to take breaks between climbs. I also brought camp shoes, breaking my own UL rule, since I knew we’d be spending a lot of time off the bikes this trip. One pannier holds Kelley’s clothing, and the other holds her sleeping pad and all of our food. 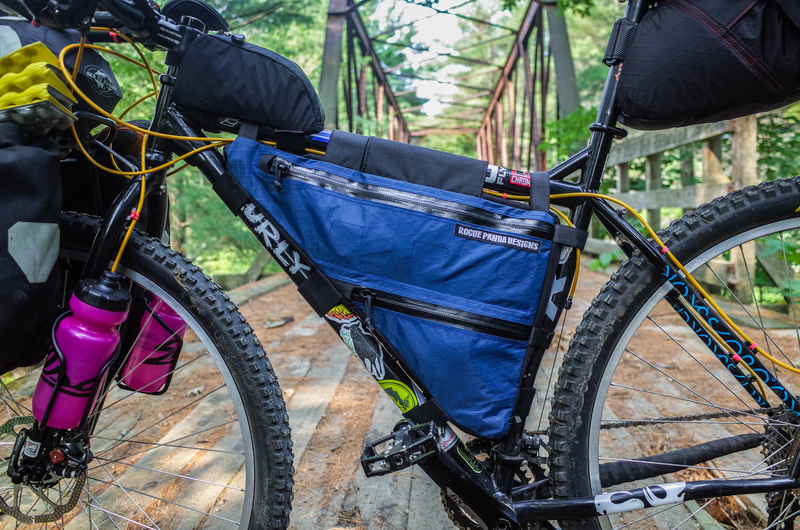 In the back, a Revelate Designs Viscacha holds my clothing, a fleece, my sleeping pad, and my cook kit. 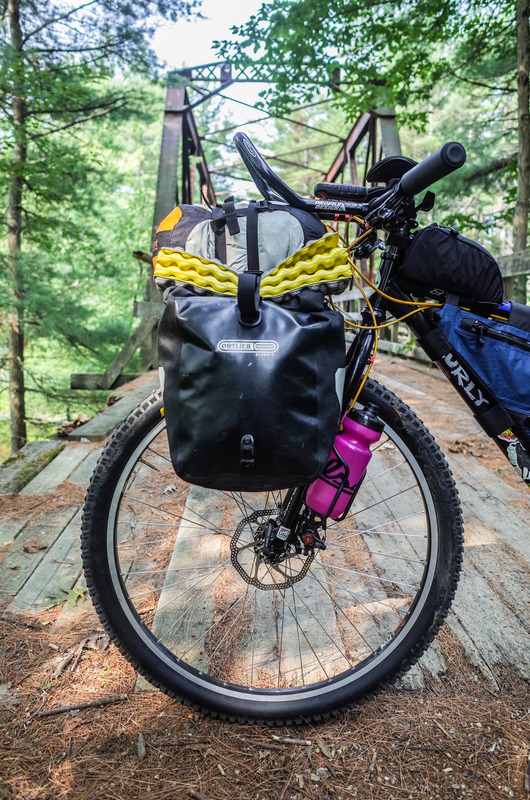 The merits of oversized seatbags are lauded universally, and they’re ubiquitous in bikepacking setups. The Rogue Panda Designs Framebag was filled to bursting. In it, I’ve got 2 liters of water, a Sawyer Squeeze filter, first aid, bike tools, spare tubes, a pump, food, accessories like my phone, wallet, passport, headlamp and batteries, and tons of little things like matches and zip-ties that would get lost anywhere else. I carried a hydration pack on this trip, but it held an iPad and a wind jacket, so it was under-filled. I could have lived without it. In the future, Kelley will start carrying more and more weight, and we’ll be getting her a new frame within a year that’ll take framebags a bit easier than her current bike. Once I lose her camping equipment, the front rack is gone. Otherwise, the bike is pretty well-specced for what I’m doing with it, and I’m super happy with how everything performed. I can’t wait for new wheels! It’s hard to love two bikes… but I’m doing my best to dole out equal attention. drools…. 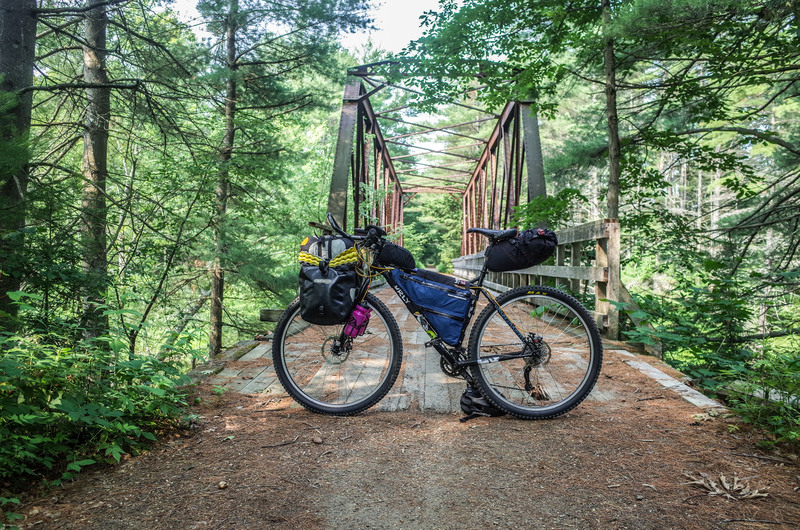 I am thinking about picking up a troll frame in a few months when I return back to the lower 48 – unless the girl here wants to sell her “too small frame” to me. How is the karate monkey different than the troll. Most monkeys I see are SS. Someone at the coop has a perty flaming orange karate monkey (beast)..any reason you chose that over the troll / ogre? 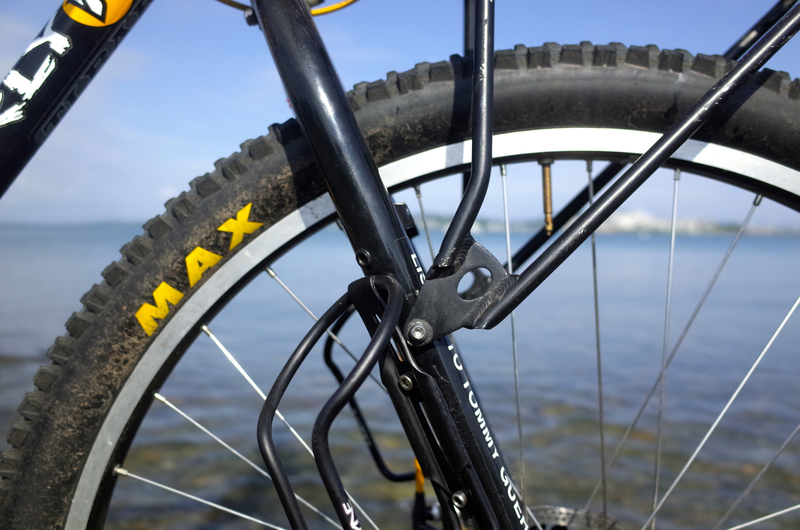 The troll uses a smaller wheel size (26″ vs 29″) that is ideal for shorter people. it used to be a standard for building “expedition” touring bikes, since 26″ wheels are easier to find in other countries. That trend seems to be waning lately, and most people use whatever wheel size they most prefer on world tours, thanks to many more international shipping options and the rise of 29″ bikes in South America, China, etc. 2. You want to run wider tires (the troll will take pretty fat 2.7 inch tires, as compared to the KM and Ogre which max out at about 2.5 inches). 3. 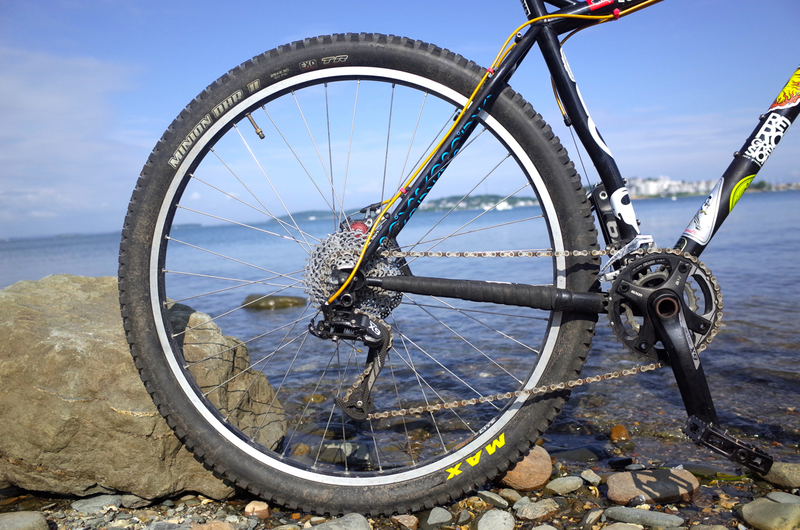 You prefer a 26″ wheel. Some people like 26″ better, are more used to it, want the third world touring insurance, etc. 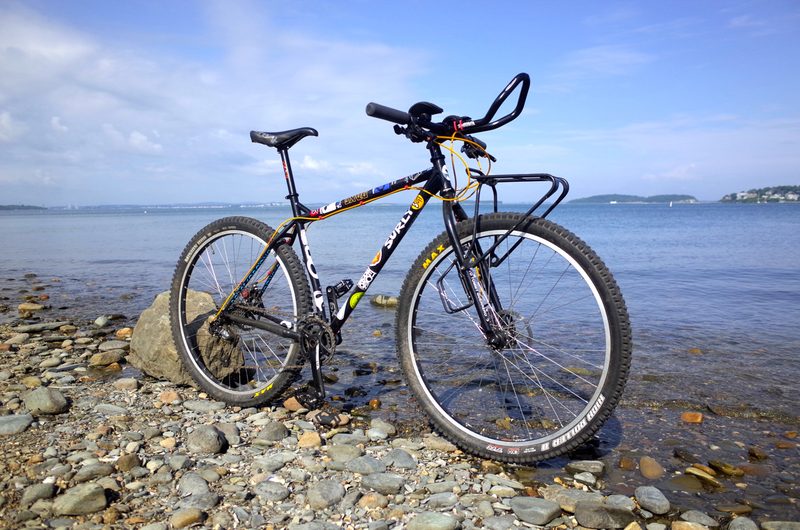 Now, the Surly Ogre and Karate Monkey are very, very similar bikes. 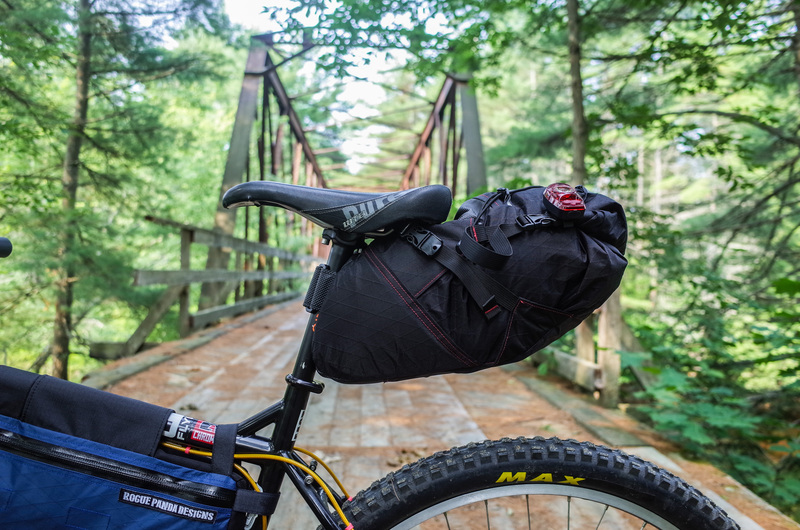 The Ogre is slightly more tuned to carry the weight of racks, and it comes with a frame and fork that has better mounts for racks and bottles. 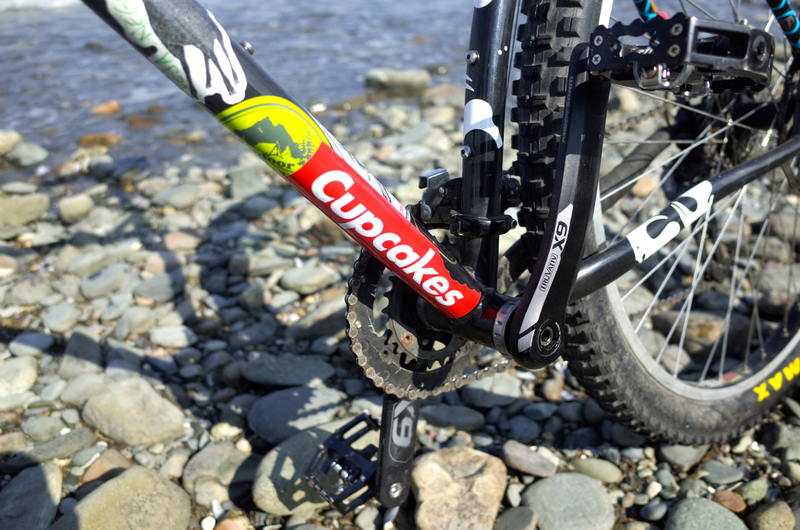 My Karate Monkey has an ogre fork for this reason. The Ogre and Troll also have crazy drop-outs that can take racks, disc brakes, single-speed conversions, Rolhoff hubs, and all kinds of other crazy stuff. These enabler dropouts are hallmarks of the frame. The Karate Monkey used to be specced with a basic single-speed dropout, but now the Karate Monkey Ops has a dropout that can take many different little “chips” to provide a lot of versatility, so it’s similar to its touring brothers in that way. So, I would get an Ogre if you want to tour and bikepack exclusively. 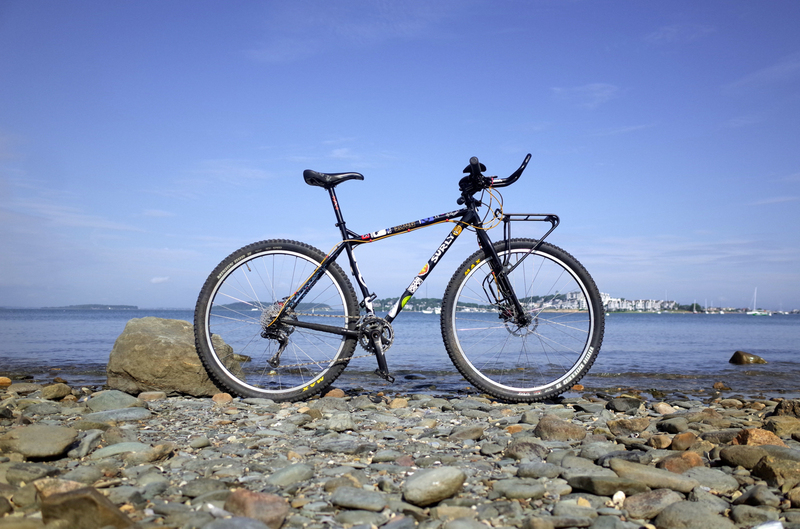 Otherwise, the Karate Monkey is a good all-rounder that can do almost everything the other bikes can. I didn’t choose a Karate Monkey over an Ogre. I got lucky with a used KM in my area and bought it. I would have gotten an Ogre if I had a choice. I also think a troll would be perfect for you. 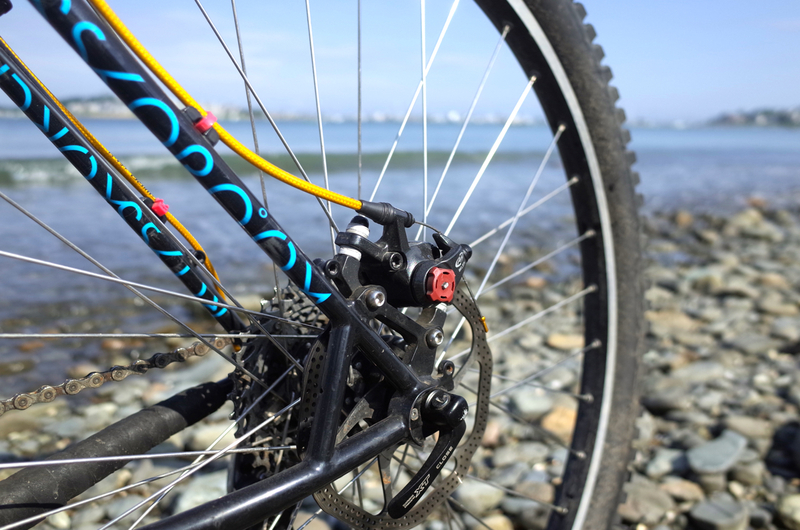 Kelley rides a 26″ mountain bike and is a bit taller than you, and she loves it. Thinking about getting one of the racktime topits for my ogre with an enabler fork. Says you might get rid of it in the future, let me know! Great looking ride. I did similar in 2008 to ride Sydney to Cairns in Oz. I now commute on that KM (find it heavy commuter, but that is good for ironman training when not on proper training ride). The thing I don’t like about this bike’s geometry is that the front wheel always wants to turn when not holding the handlebars, which means the bike always wants to fall over even when you are standing over it, or against a wall (panniers helped but didn’t solve the problem. Amazed you got your photos with just a helmet under the back wheel. Do you not find it wants to fall over? I have an Otlieb handlebar bag on mine wonder if that is the difference. Tricky thing. It depends a lot on how you load the bike. With the front panniers on there, I had almost no self-steer, was able to ride without my hands on the handlebars, and had no trouble propping the bike up for photos. A lot of things could account for this- the weight distribution in my panniers, the length of my stem, the size of my tire, etc. etc.